WASHINGTON, D.C. -- Fifty-eight percent of Americans believe the U.S. rates "very" or "somewhat favorably" in the world's eyes. Though the current figure is up just slightly from the 55% recorded last year, it represents the highest figure Gallup has found since 2003. 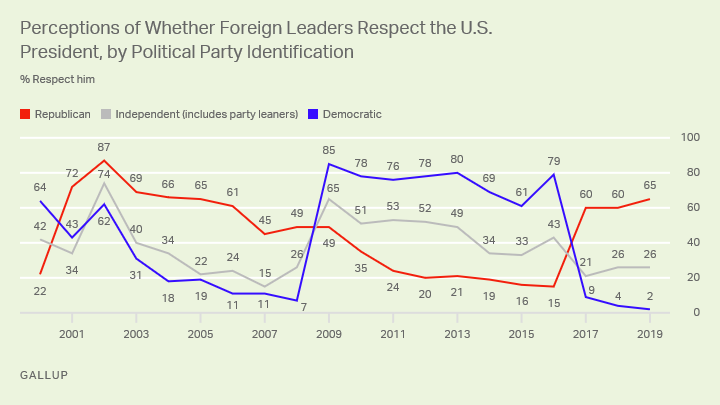 The increase in the overall figure is the result of an increase in the percentage of political independents saying the U.S. is rated favorably abroad, up eight percentage points, from 50% to 58%. Meanwhile, the views of Americans identifying as Republican or Democratic haven't changed. A relatively high proportion of Republicans say the U.S. is viewed favorably (80%), matching their views in 2018. This is the highest level of Republicans' confidence in the country's global image since 2002 during the post-9/11 period of the George W. Bush administration. Far fewer Democrats during Donald Trump's presidency have said the country is viewed positively abroad, with their latest 36% matching last year's figure. Democrats current negativism on this measure is similar to what it was at certain points in President G.W. Bush's second term. At the same time, Americans are fairly upbeat about the country's global image, the percentage satisfied with the position of the U.S. in the world today is also at a relatively high ebb. Though Americans remain more likely to say they are dissatisfied than satisfied, the percentage who are dissatisfied is at its lowest since 2005. The years of 2000 to 2003 were an exception to the dissatisfied pattern, as Americans were more satisfied than dissatisfied by double-digit margins amid a strong economy -- as well as the rallying effect that occurred after the attacks on 9/11. In February 2003 -- as the U.S. failed to win UN approval for the Iraq War -- Americans were about equally satisfied as dissatisfied. Republicans (74%) are about four times as likely as Democrats (19%) to say they are satisfied with the position of the U.S. in the world. For Republicans, this is the most satisfied they have been since the Bush presidency, whereas Democrats' ratings are about as low as they were during the same time. 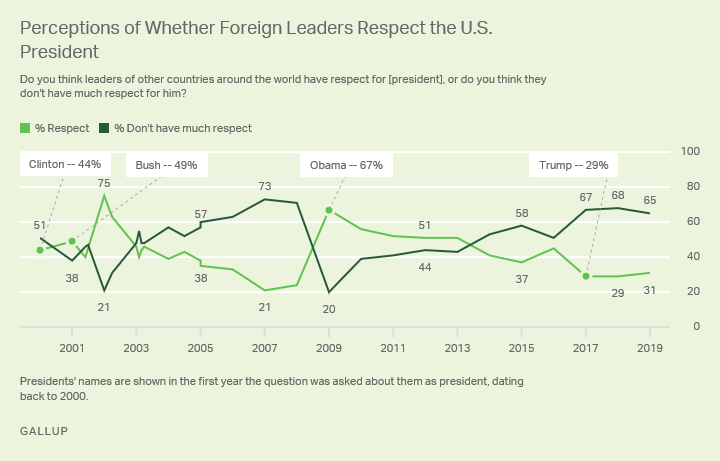 Though Americans as a whole feel relatively positive about how the U.S. is viewed abroad, most don't think foreign leaders respect the president. Just 31% currently say President Trump is respected, similar to the 29% saying this in polls taken during the first two years of his term. 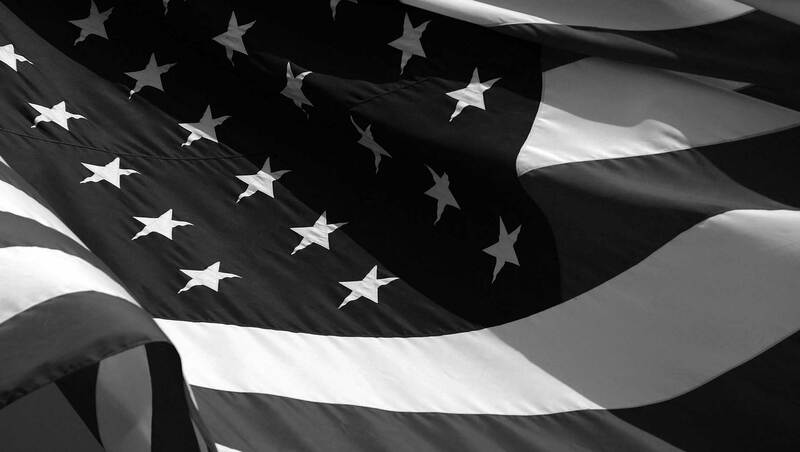 Americans' perceived that other nations widely respected Presidents G.W. Bush and Obama in the early years of their presidencies, but these views soured over time. Six years into his presidency, at the height of the Iraq War, only 21% felt this way about Bush. The perception of Obama as respected fell to 37% by 2015. As with many other measures, Americans' views of world leaders' opinions of the president differ by partisan identification. Most Democrats believe President Trump is not respected while most Republicans say he is. 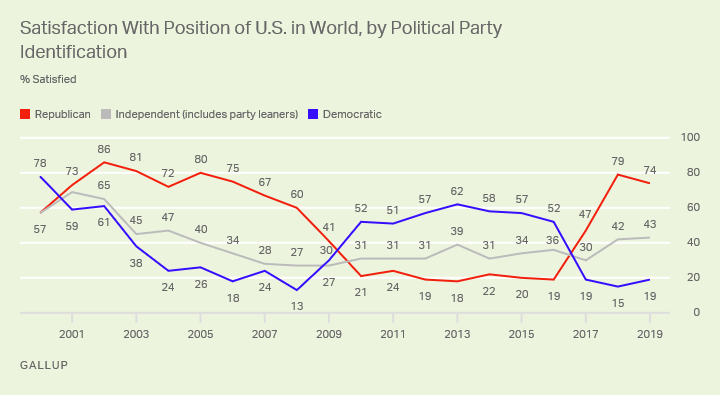 Democrats' belief that the president is respected by world leaders plummeted 70 percentage points in the transition from Obama to Trump in 2017, and their views of Trump being respected by leaders hasn't improved since. Meanwhile, about two in three Republicans (65%) say Trump is respected by leaders abroad, up slightly from Trump's first two years in office. 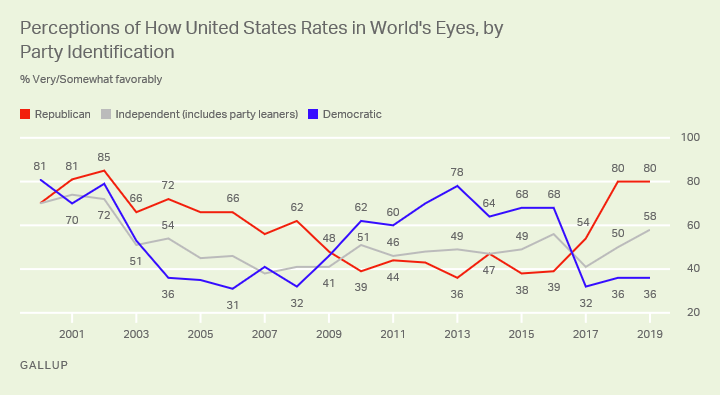 Though the United States' relationship with a variety of countries across the globe has been tumultuous in recent years, Americans generally see their country itself as being viewed favorably. Trump's perceived negative global image, with only 31% saying he's respected by world leaders, may reflect the bumpy relationships that have characterized U.S. foreign policy with even some of its strongest allies, such as England, Canada and Germany. His lower perceived ratings may also reflect his generally low approval ratings at home, which was likely also a factor in Bush's and Obama's subpar ratings later in their terms. Trump has also received low ratings from the world's adult population, which Gallup will update in its annual world leadership ratings on Feb. 28. Currently, Americans may be separating how they believe their country is viewed from whether they think the president is respected. Americans have expressed record-low confidence in the federal government's ability to handle international problems, so the uptick in perceptions of favorable views of the U.S. is not an endorsement of Trump's policies and how they are received abroad. Rather, it may reflect on stronger economic times, which has led to greater satisfaction levels in the past. The leaders of some of the United States' closest allies are viewed more favorably than unfavorably by Americans, but with favorable ratings below 50%.